One of the most SEO friendly independently owned real estate sites on the web! Davies-Davies & Associates is a local real estate company that’s been helping people buy and sell beautiful properties in Lake George region for years. 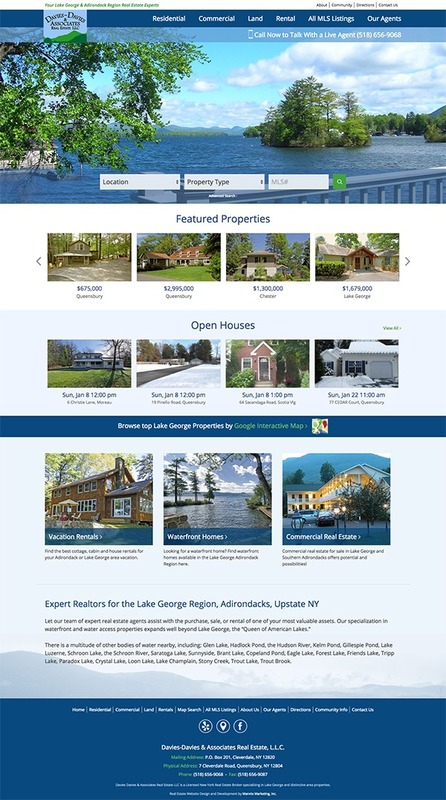 This Lake George based real estate company wanted a website that put them a cut above the rest, so they partnered with the team at Mannix Marketing for a professional real estate website. Our team created the Davies-Davies realty website with features like an interactive map and cell phone search engine, making this site progressive and modern while allowing visitors to explore their options. The color scheme feels like Lake George, and the stunning landscapes of the waterfront further encourage customers that their new home is calling their name!